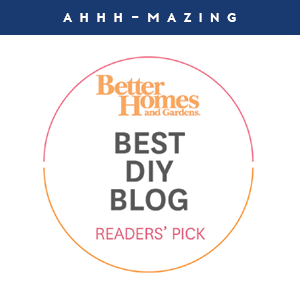 Although you are probably ready for another kitchen renovation update, today's kitchen post isn't as grand as a full space reveal or even a moulding update. Boy do I wish we were done, it has definitely dragged on longer than I ever expected and I am so ready to just start using it and enjoying it. And I am sorry that y'all have to be excited sideline spectators while we work through things behind the scenes. Aside from fighting with fully booked weekends, summer schedules and sports, we have run into a few roadblocks that have set us behind schedule (more on that when we get them all figured out - but imagine me banging my head against the wall multiple times). Buuuut, we just picked up the last batch up trim last week and I have a feeling that even getting toe kick and crown installed will start making big differences in getting the space to a finished state. 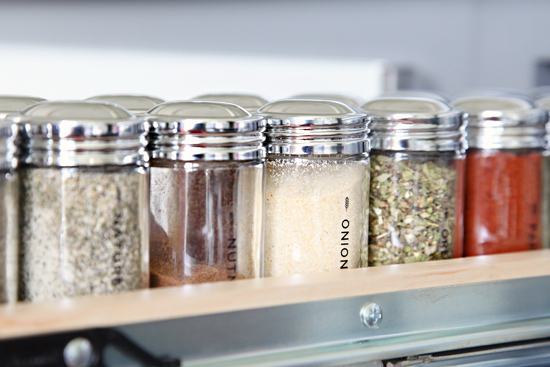 Until then, my busy hands couldn't wait to tackle our new spice drawer! A few years ago, Bryan laid his eyes on a pull-out spice drawer, and I had to fight my way back to becoming his primary love interest again. He is our family chef, and he loved the idea of keeping cooking essentials in an easy-to-access location near the stove, without having to clutter up the island countertop with trays of oils and spices. 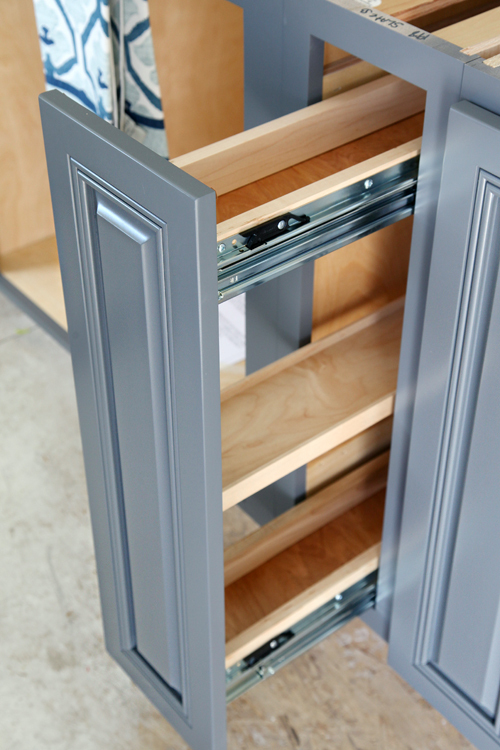 After many positive comments and reviews regarding pull-out spice drawers in kitchens (and testimonials that the heat of the oven doesn't typically impact the contents), we kept it high on our kitchen wish list even when other things stopped making the cut. Of course, I was beyond excited to have a new cabinet to organize, but didn't realize I would have to bump it up on the priority list. I went to put our spices in the cabinet, and the awkward jar shapes and sizes didn't all fit and I couldn't even slide the drawer closed due to the height of many of the containers. 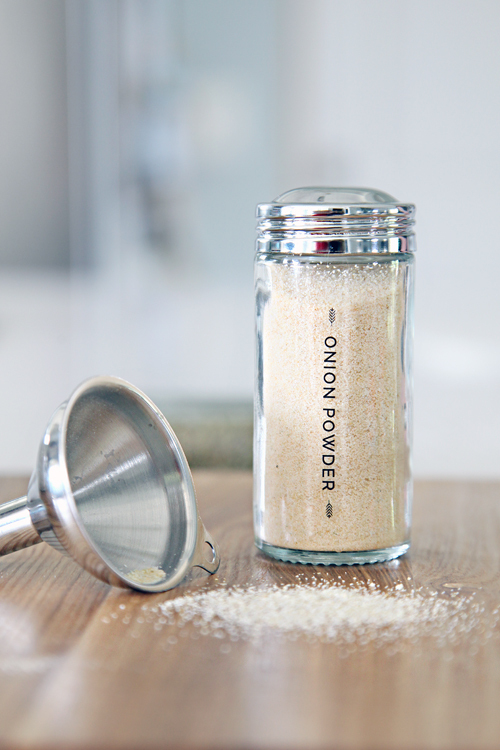 I adore the glass jars, but instantly ran into a labeling issue when I spotted the domed lids. 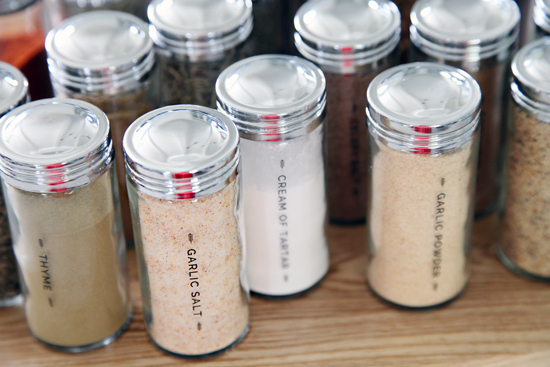 Typically, adding labels and stickers to anything round causes gaps and creases and doesn't offer a seamless look. There was plenty of area on the sides of the jars, so I decided that I would just label the sides and all would be well in our world of spices. In these labeling situations, I naturally reach right for my Silhouette die cutting machine. It can do just about anything and everything in terms of labeling (vinyl, stickers, etc...), but for this project I wanted to try something new. 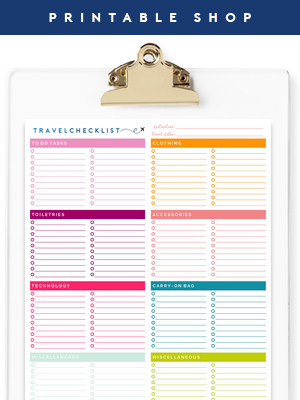 I have read a little bit about using decal paper, and thought this would be the perfect project to step out of my labeling comfort zone. I also loved that this labeling solution is one that anyone can do at home with a standard computer/printer setup; no fancy cutting machine required. I searched around for decal paper, and ended up ordering this from decalpaper.com. It comes with very helpful step-by-step instructions, making this process much easier than I initially anticipated. Just be sure to order the paper for your type of printer (laser jet vs. inkjet). 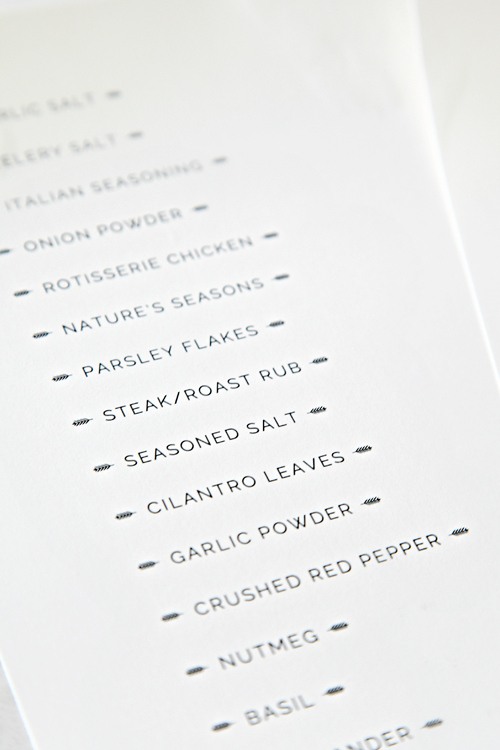 Once I had the paper, I used Microsoft Word to create some very basic spice jar labels. I then printed them onto the decal paper (make sure to remove the tissue film and print directly on the glossy portion of the paper). I did a quick check to be sure the font didn't run off the edges of the jars, and also ended up re-printing it with the font bolded for easier reading. 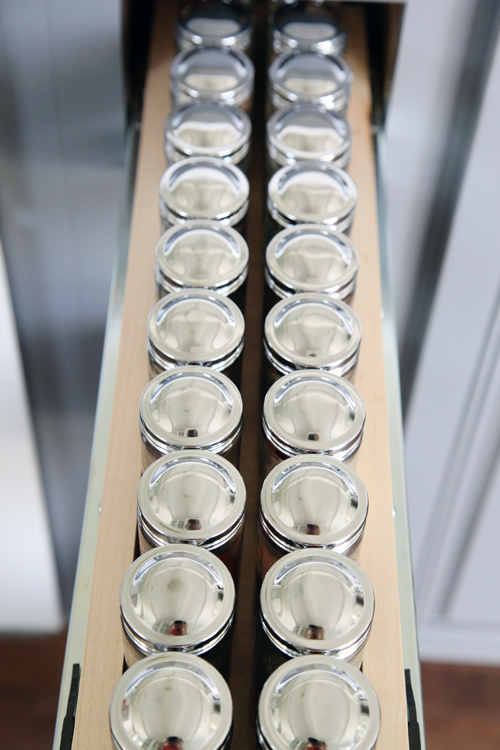 Prior to labeling and filling, all of the jar labels were removed and the jars were washed and dried. 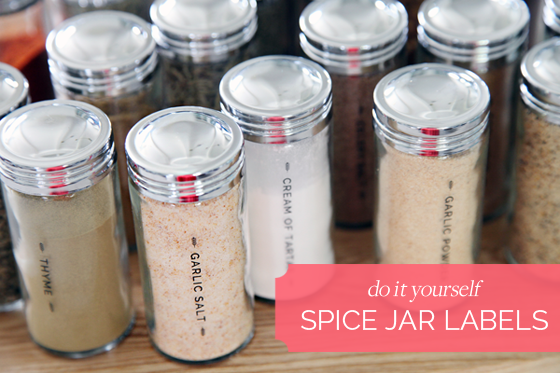 I did this both ways, but I found it easiest to fill the spice jar first, and then add the label immediately after. When I did the label first, I then ran the risk of ruining it while pouring in the spices (or having to wait the three hours for the label to cure). Small spoons and this funnel were both really helpful in transferring the spices from their original packaging to the new jars. After the jars were clean and dry, I cut out each of the labels. I eventually realized that the clear portion of the decal paper around the font will dry to an almost invisible state, so how you cut the label doesn't have to be perfection. 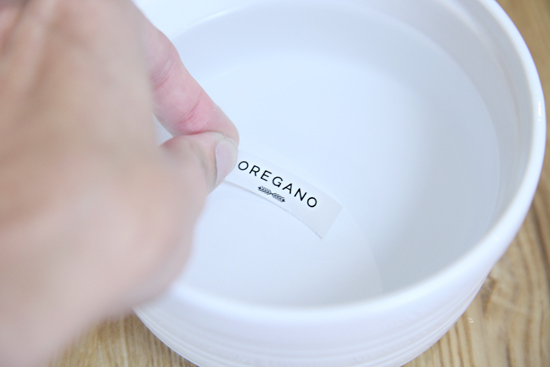 To activate the decal label, I dipped it into a small dish of lukewarm water until the clear portion of the label began to separate from the backing. The warmer the water, the more the clear portion of the label began to curl and was harder to work with. When it came to applying the decal label, I found it easiest to place the edge of the label onto the jar and hold it with my finger while I carefully slid the backing out from behind it. Once it was in place, I used a paper towel to pat both the jar and the label dry. 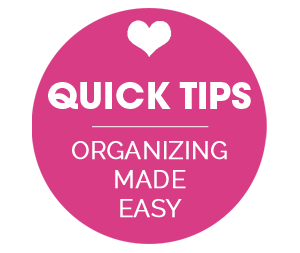 You don't have to be super quick, you will have time to work with the label and adjust it until it is right where you want it. It took about 5-10 minutes to really start forming a bond to the jar. And that was it! The label decals took a total of three hours to completely dry and cure, and once they did, they looked so professionally finished! The label was 100% seamless and I appreciated that they had a such a clean finish. Speaking of clean, the label instructions do indicate that you can add a clear coat of poly to the top of the decal to extend the life and allow for heavier scrubbing of the containers. I didn't want to put poly near our food, so I opted to leave them without. I have already wiped these down with a damp towel and they seem quite durable, so I am hopeful that they will hold up to gentle hand-washings down the road. Again, imagine my forehead and my palm meeting at this very moment. My poor head right? Suddenly it didn't matter how beautiful the spice labels were, I placed them too far down the side of the jar to completely read them while in the drawer. Ugh and oops! The first set of labels were already cured, so I left them and just flipped the jars over to add a second label at the correct height on the other side. I guess the bonus is that the jars are now labeled from both sides so there will never be any confusion about what is being used. SO much better! I fell right back in love with this labeling solution and then I asked Bryan for a head rub. The labels are pretty fabulous and overall really easy to read, however, they do get lost slightly in some of those busier, dark spices. The good thing is that these labels can be whatever you want them to be, and you can change the color of the labels just by changing the font color on your computer. Lighter colored labels will work better with darker spices, while darker wording really pops against lighter spices. I also alphabetized them to be sure they are even easier to find in a "pinch". When I was finished with the labeling, I added the expiration dates to the bottom of each jar with a dry erase marker (similar to what I just did with my makeup). A few of the original spice containers had some leftover spices that didn't fit into the new jars, so those are temporarily stored in a basket in another cabinet for future refilling. Once they are gone, we will just start purchasing our spices in smaller amounts that accommodate the sizes of the new jars. Now we can really "spice" things up in the kitchen! OK, enough cheese, I am off to open and close the new drawer a few times to enjoy the small amount of kitchen progress. I would love to know if you have ever given decal paper a try and what you thought of it? **Update! In typical Jen fashion, one of my labels had an incorrect spelling. I tried scrubbing off the label with a wash rag and it didn't budge (great news for future cleanings!). However, I was able to carefully scrape off the label and update it very easily with a new decal. A small blessing in disguise I suppose, now I know that I have some flexibility with the system in the future. Thanks for catching that friends! It looks really great Jennifer. I wonder if you might have one spare jar? The built in spell checker in me can't help but tell you that you mis-spelled "oregano"...but maybe you are okay with that and if you are, that's cool! Thanks so much for catching that Jocelyne! The post has been updated (and I added one more facepalm to my day). :) xo! You are so funny Jen! I also had notice it. It happens. I wonder if the decals would lay flat on the domes? And I love your choice of fonts (as always)! 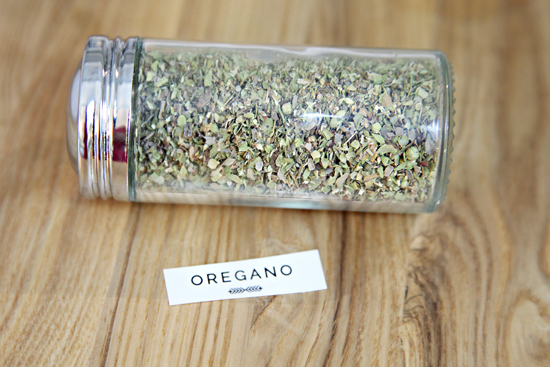 And I don't want to sound too nit-picky, but just in case it's the image you are using for Pinterest (since I noticed it was featured in a number of photos), oregano has an a instead of two e's. Again, gorgeous project and just wanted to mention that in case you wanted to change the Pinterest image. 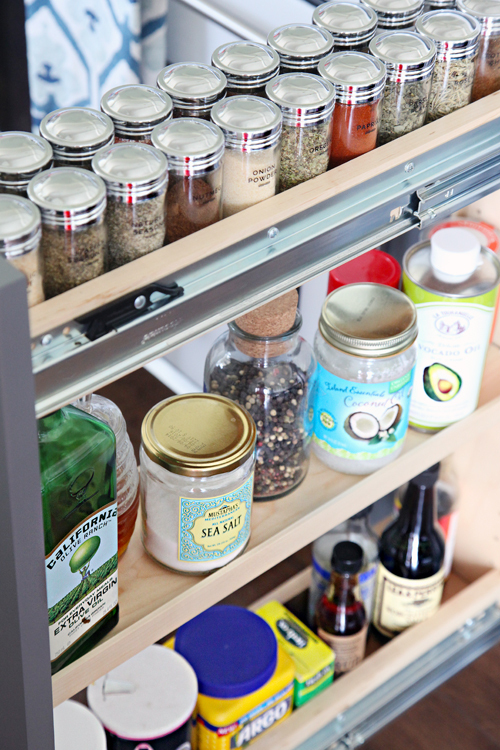 Thanks for sharing this with us...I am definitely adding the spice drawer to my wish list! Thanks for the freezer advice Rachael! We definitely go through some spices faster than others so I appreciate the tip. Also, thanks for being so kind in pointing out the spelling mistake. :) I was able to get it fixed without any issues. Whew! Hello Jen! 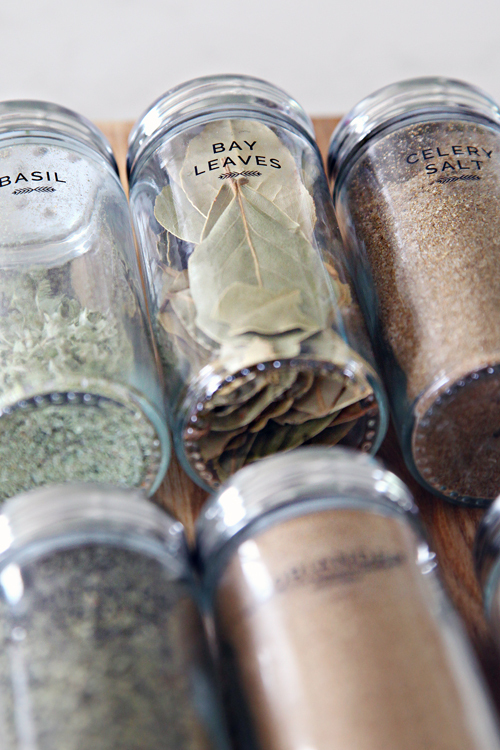 What a timely post, I am in the process of re-doing my spice drawer too. I found adorable milk glass spice jars at an antique store! I just need to make my labels now... But I did want to let you know that the word Oregeno is spelled wrong, it should read Oregano. Not trying to pick, but your lovely jars deserve the right spelling! :0) Keep up with the kitchen progress reports, we love them!!! Great idea! I love this DIY! 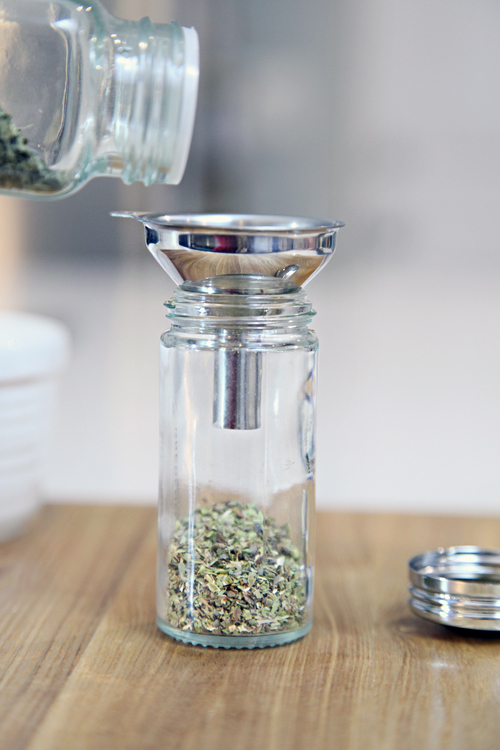 A great solution to all those awkward sizes and shapes of spice bottles. I love the cabinet by the stove. So handy! I'm always excited to see your projects, they are always great and inspiring! Well, first you shall show us the little details from your kitchen and then the best for last (the renovation), or so to say. I LOVE decal paper, the look of it is professional which is great about it. I never thought of using it on kitchen spices though. Where/when did you get this fab. idea? Those jars are so cute! 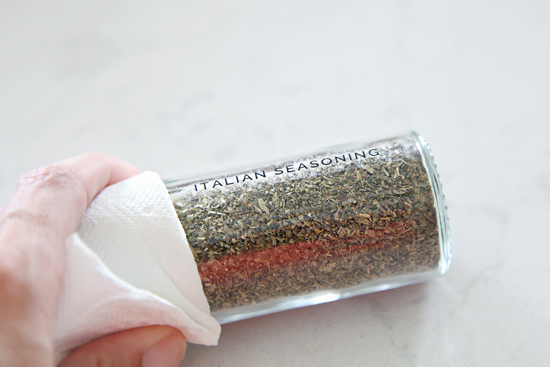 Don't worry about the oregano mishap...I happen to be the world's worst speller! One time at my job, I had a meeting with an area school principal and in my outline for the meeting (which was passed out to everyone in the meeting) I wrote "principle" instead of "principal"! I didn't even catch it until after the meeting, my BOSS pointed it out to me! That is just one embarrassing example of my horrible spelling! Love this idea!!!! 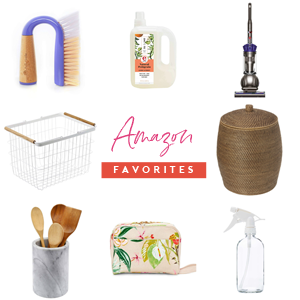 I am getting ready to move & a kitchen redo will be happening. How did you come up with the little feather on the side? The feather is from the font: Bergamot Ornaments. I just have a little idea. 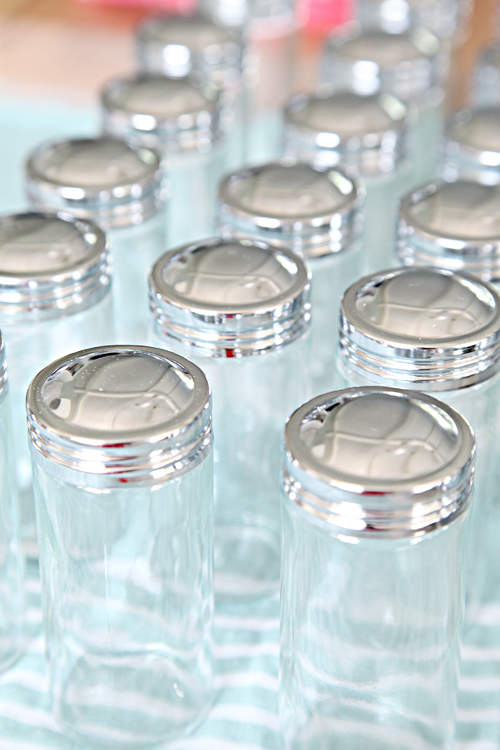 You could also somehow put the lables on top of the jars (the lids) so you could quickly have a glance at the tops of the jars for easy access. 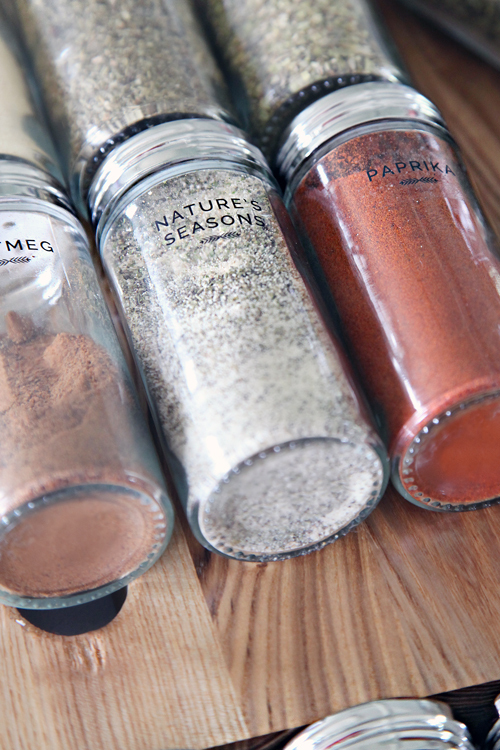 I'm so jealous of these spices, eek they look great! It's really easy on the eyes to have uniformity. Pinning! Was curious if you think maybe it'll get old having to look at the side of the spice to find what you want. Is there any way to put the labels on the lid so you don't have to hunt? Just curious why you chose the side is all. Hi Stacy! I don't think so, the spices are just below counter height (and we are not all that tall), so they are easy for us to find and read. The lids of the spices are domed so not the best for labeling... We can always add something small to the lids down the road if we find this setup isn't working well enough. These came out super nice! I am wondering what the font is...it looks great. Thank you! The font is Raleway. xo! Love these! Can you share what font you used for your labels? I just updated our spice jars and have been debating how to label. I love the clean look of this font. Oh do I sooo hear you on the frustration. Kudos to you for pursuing every last bit til you were completely happy with the result. All that frustration turns into sighs of happiness for months and years to come, and that's what I focus on when I have to redo a project AGAIN just to improve one tiny tweak. It is worth it. Congratulations on a beautiful outcome! Beautiful solution!! I'm also looking for ideas after an Ikea kitchen makeover. I could see where a single letter on the lid representing the first letter of the spice would be helpful in locating a particular bottle from the top. It would also help with putting them away. Thanks for the inspiration! This looks so beautiful and it makes me so happy! Now you have me wanting to label all the things!! And boy, do I want one of those pull out spice cabinets now!! I'm in love with your spice bottles AND the labels! So clean and simple looking. And it is so nice to hear that I'm not the only one who starts a simple project only to have many little problems make it not so simple! Jen, Growing up my mom often used decals to label jars so I'm really glad decals are back. In those days, of course, there were no computers so you had to buy pre-printed sheets of decals with the spice names and cutsy images. So if you used a spice that wasn't on the pre-printed decal you were out of luck! This way is so much more flexible and personal. 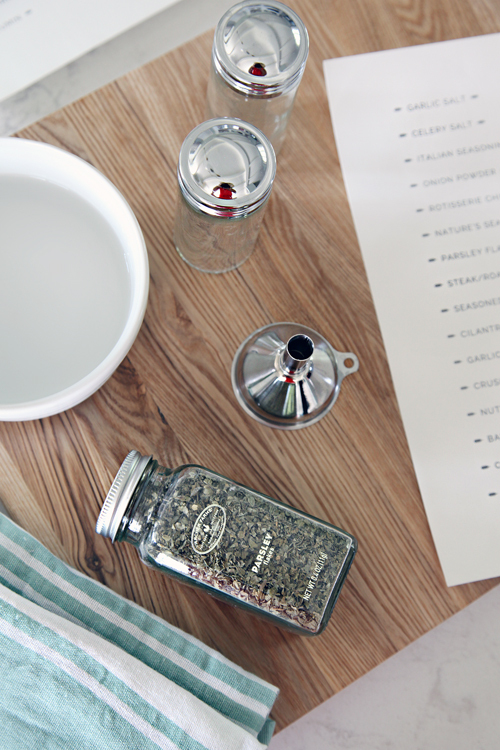 Your spice jars look lovely and I'm definitely going to try this in my kitchen. Everything you do is amazing-so happy you share your great ideas. Keep it up! I love the way your spice jars came out. I use 4 oz. canning jars upside down in a shallow drawer (I like the colorful display they make), but hadn't come up with a satisfactory labeling scheme. This looks like a solution for me! 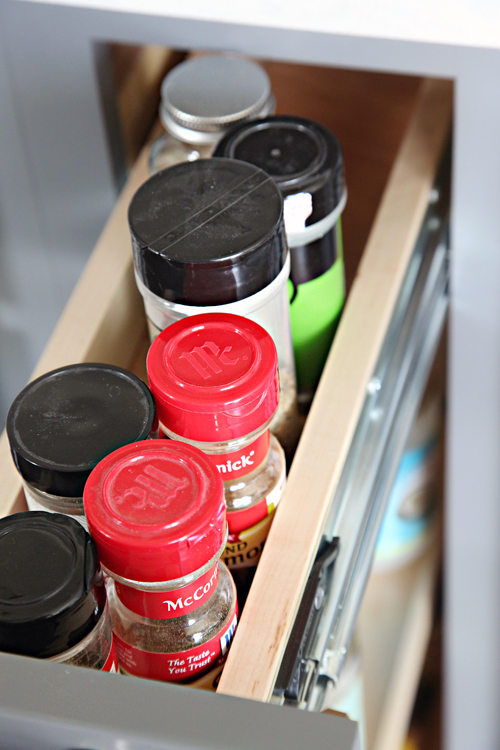 I have a lovely built in spice rack in the cabinet above and use it for spice mixes. I am fortunate to have a kitchen with space. Can't wait for your redo to be done, so that you can enjoy it completely. These are wonderful! Love labels! 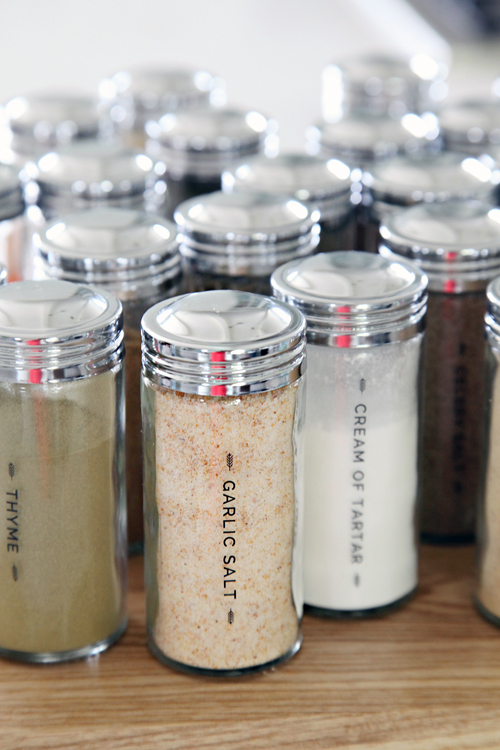 :) And, I really like the jars, too - so streamlined and uniform. Much nicer than my dollar store plastic lidded stacking containers. Thanks for sharing! What color paint on cabinets? 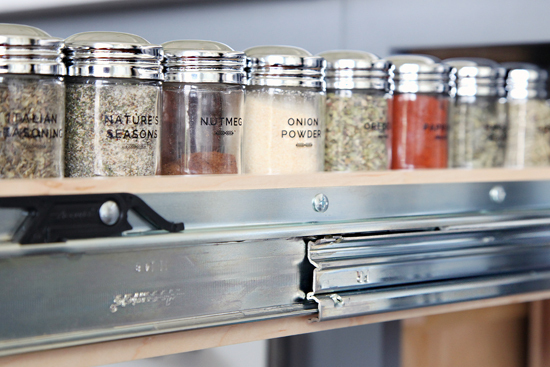 I'll be curious to see if you come back and redo your spice rack in the near future! Reason; I have the same one and spent the time and money to get nice jars and label them and after a few months, decided it just wasn't working. Anyways, I ended up using the jars for little craft storage and such and went back and started over with square jars. I was having the issue of them rotating/spinning so that I could never see the label. Sounds simple to turn them around, but it just got annoying when the labels weren't facing out (OCD?) ha! I guess Archer Farms was way ahead of the 'game'! Anyways, I'm excited to see how it works for you! This is wonderful! Hope you end up selling these labels on your etsy store!!!! Thanks! I love the tidy look of the jars being the same and the labels are so cute with the feather! One the Decal Paper did you use the clear or white paper? Hi Jen! What font size did you use? Also, how are the labels holding up? Are they still intact? Have you noticed any fading? I apologize but I can't recall exact font size. I just do a quick test print on scrap paper to get a good idea if everything will fit. Hi! I came across this while redoing my spice drawers. With the decal paper, do you think the clear decal edges would be noticeable on a shiny white surface? My jars have white lids and I'm trying to find a label that gives a really professional look. Thank you! Hi! This is a great idea, although this wouldn't be an option in my kitchen. 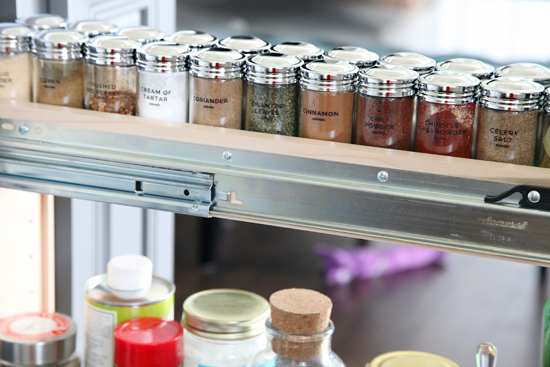 Wondering which you think would work out better for spices - a lazy susan or a tiered organizer like you have for jarred items. Thanks!! Thanks for your response! Do you find that lazy susans can get annoying when trying to get to the items in the center? I just want to say I love this so much! I have been going around in circles for days trying to choose not only the type of jars I want to use for my spices, but the font/label style as well. I like my things to look sharp, neat, and simple and this is just that. I went to my local Hobby Lobby last night and finally found some jars I liked. I got home cleaned them up and transferred my spices over. I did not have a font or label style picked out yet so I just labeled a piece of paper and placed the jars on top for now. I did not have enough jars since Hobby Lobby only had 10, I want online to order more. I then started looking around online and found a different jar style I liked. At this point I was really upset and frustrated because I liked the other jar style even more. But I kept telling myself that the ones I had where just fine because I already have 10 filled and waiting for the others I already ordered. 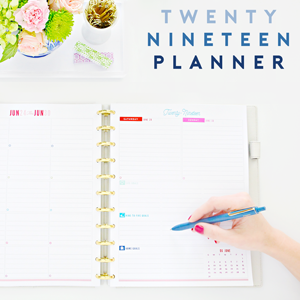 I went to Pinterest and discovered your Pin and Blog and fell in love. Your style and your spice jars made me really like the ones I had picked out originally. I just wanted to say thank you for the ideas and sharing such a beautiful project. Sometimes decisions are hard (especially for me) but I have learned to love what you have and bounce others ideas with your own to create something unique. I was trying the link for the decal paper and it was showing an error message... is there another brand of paper you could recommend or a different website with it? What font did you use on the jars? And what Font size? Do you sell these already done in your shop?